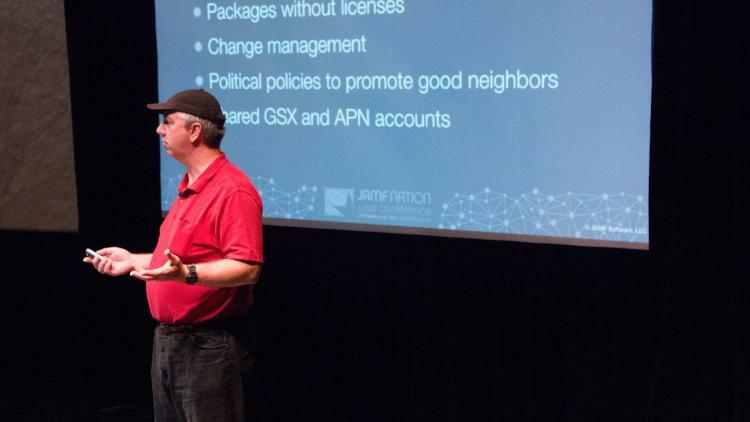 The Tar Heel university school system was proudly on display when Everette Allen, Josh Hodges, and Kevin Snook showed us the value of and ways to deploy a highly distributed JSS Cloud Infrastructure using new features in Casper Suite version 9. The North Carolina University System realized that a statewide educational organization could lower costs by sharing a single, hosted, Casper Suite similar to a multinational company. Version 9 of the Casper Suite made this possible with Sites. The school system banded together to purchase a JAMF Software hosted instance of the Casper Suite. They discussed ‘the good, the bad, and the challenging’ of implementing this project. The good: it works! The schools are able to share packages and scripts, cut costs, and help out one another. A few of the challenges that they have had to address are ensuring that Network segments don’t collide, putting proper prefixes on packages to avoid confusion, and navigating the politics of LDAP/AD access. The school system currently has 41 Sites and in order to create a Site, they require 10 licenses of either OS X or iOS devices, secure access to a supported directory for a group of Casper Site Admins, firewall changes, and an internal NetBoot or SUS servers. By banding everyone together and pulling in all those resources, they can address the needs of each university and department. “Collaboration is the key,” said Josh Hodges.